Did you know there is a lot of detailed marketing research which shows potential customers need to view marketing and advertising messages several times in different ways before the customer makes the choice to buy from you. As a sussex marketing agencies we listen to businesses, Some businesses will stop at the first hurdle if they say NO. However if a customer does say no then its not the end….its the beginning. Dust yourself off and jump back on the horse and continue. You might have seen social media stats on Facebook, Twitter, Pinterest, You Tube or LinkedIn showcasing that it takes between 5 and 12 contacts before the vast majority of sales are completed. Just stop and have a think about this, Of example…How many times do you speak with a customer before they buy your product or service? you will get that “luck” where a customer will know what they want and just buy from you, however most of the time the customer will be going on a journey with you as you overcome questions from them before they make a decision to buy from you. 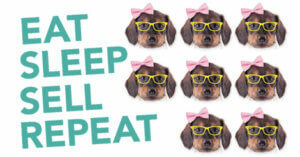 Here is our advice to help assist with marketing, its really simple but Repeat, Repeat and Repeat. Just keep reaching out to your customers This secret cheat is simple. Just keep going. 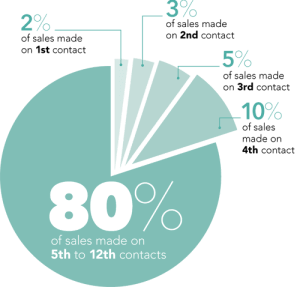 The more times you reach a client, the more chance of making the sale. Better to contact 1,000 prospects 5 times than 5,000 just once. So does that mean you keep calling people day after day asking “ready to buy yet?” Maybe that could work for some. But for most, it means using different methods. Let us plan a campaign for you which has 5 or more contact steps. an e-shot with an invitation to meet. promo postcard with a focus on an individual product or service. We hope this will help you win more customers, please contact us below as we’re offering FREE consultations to help your business do more online.